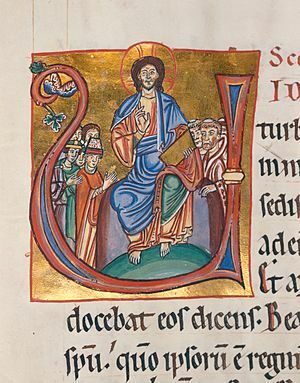 Christ Pantocrator seated in a capital "U" in a manuscript from the Badische Landesbibliothek, Germany. A manuscript is any document that is written by hand, not printed or made in some other way. The early history of writing is intimately connected with the history of writing materials, of which the manuscript is one. 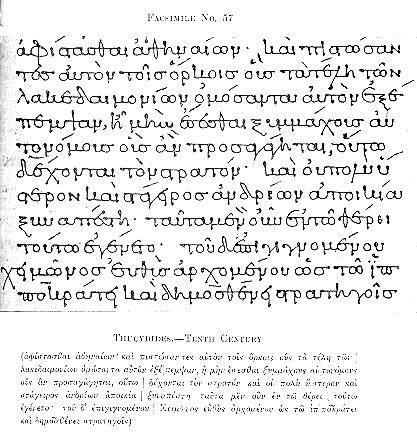 Early printing made use of many ideas which developed in the era of manuscripts. Inside the letter is a picture of a master in cathedra expounding on the Aphorisms of Hippocrates. Initial "V" rendered as "U" of "Vita brevis, ars vero longa", or "Life is short, but the art is long". "Isagoge", fol. 15b. HMD Collection, MS E 78. After plummeting in the Early Middle Ages, the high and late medieval period witnessed a sharp increase of manuscript production. Manuscript, Codex Manesse Most manuscripts were ruled with horizontal lines that served as the baselines on which the text was entered. Manuscript Facts for Kids. Kiddle Encyclopedia.